VANCOUVER, BC, April 2, 2015 — Mirasol Resources Ltd. (Mirasol) (TSX-V: MRZ, Frankfurt: M8R) has been advised by First Quantum Minerals Inc. (First Quantum) that it has relinquished its option to earn up to 75% of the Rubi project in the Eocene — Oligocene porphyry belt of northern Chile. First Quantum is exiting prior to the first earn-in point as defined in the terms of the JV Agreement (see press release 18th September 2013 and 27th August 2014) and so retains no equity or royalties in the Rubi project. Mirasol President and CEO Stephen Nano stated that Mirasol would like to thank First Quantum for the investment at Rubi and the contribution that their team of skilled geoscientists have made to advance the understanding of the project geology. On the 16th January 2015 First Quantum completed a 6,054 m, 16 hole combined reverse-circulation and diamond drill program at the Rubi project (Figure 1). The drilling was focused on a series of covered targets (see news release 10th November 2014) at the Lithocap prospect and a large gravel pediment-covered area at Pampa del Inca. Assays from this drilling returned low-level Cu and Mo associated with visible chalcopyrite and chalcocite, over narrow intervals of 2 to 6 m, in some case with several intersections of this type per drill hole. Preliminary review of these data shows the highest assays are within the range 500 to 3,150 ppm Cu and 20 to 165 ppm Mo (Figure1). Drill holes with these anomalous assays cluster predominantly in the Lithocap area where they are associated long intervals of sericite-clay-chlorite alteration with abundant disseminated pyrite and gypsum veins. Propylitically altered diorite dykes with epidote-pyrite stockworks where also noted. In the period from October 2013 to February 2014 First Quantum completed over US$2.8 million of exploration at Rubi exceeding its first-year spending and exploration commitments. First Quantum generating a large exploration database consisting of airborne magnetics, gravity, IP and MT electrical geophysics, extensive soil geochemistry grids, hand-held spectrometer alteration studies and drill hole geology and geochemistry. Prior to determining the next steps for exploration at Rubi, Mirasol will compile and analyse the data received from First Quantum. 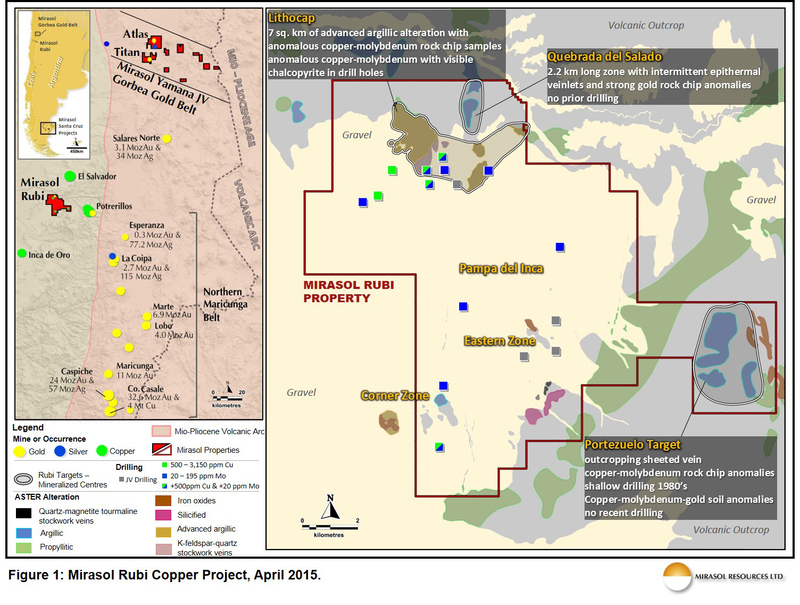 This analysis will focus on the Lithocap, Portezuelo and Quebrado del Salado areas to determine if there are exploration vectors in the data that may indicate untested Cu–Mo and Au drill targets at these prospects. The Rubi Project covers approximately 13,400 ha and was identified and staked by Mirasol through its Chilean project generation program in 2007. Rubi is located within the Eocene- Oligocene age porphyry belt of northern Chile that hosts many world class porphyry copper deposits. The Rubi Project is centred within a regional scale cluster of large porphyry copper mines including the El Salvador (1.2 Bt at 0.49% Cu, 0.022% Mo and 0.1 g/t Au) and the Potrerillos (670 mt at 0.6% Cu) mines. Mirasol’s exploration at Rubi has identified areas of alteration with indications of Cu, Mo and Au mineralization. These include the 7 sq km Lithocap prospect defined by a large area of advanced argillic alteration; the copper and molybdenum anomalous sheeted vein zone at the Portezuelo; and the Quebrada del Salado gold prospect. Extensive gravel cover at the project may conceal as yet unrecognised mineralization. First Quantum elected not to drill at the Portezuelo and Quebrada del Salado prospects. At Portezuelo, sheeted veins with anomalous Cu and Mo are intermittently exposed through thin gravel cover and road cuts over a 1 km strike length. Portezuelo received limited shallow drilling in the 1980’s but has been drilled subsequently. At Quebrado del Salado small scale historic gold workings are locally developed on an epithermal veinlet zone that outcrops intermittently over a 2.2 km strike length. Select surface rock chip and dump sampling by Mirasol and First Quantum returned assays up to 14.1 g/t Au at (average of all six samples collected 3.34 Au g/t) Quebrada del Salado. There has been no previous drilling of this gold prospect. Stephen Nano, President and CEO of Mirasol Resources has approved the technical content of this news release and is a Qualified Person under NI 43 -101. First Quantum Minerals operated the Rubi Joint Venture and generated the geological, geophysical and geochemical information reported to Mirasol Resources. First Quantum uses industry accepted procedures for the collection and analysis of this information including a formal quality assurance and quality control (QA/QC) program and ISO 9001:2000-accredited assay laboratories for geochemical analysis. Mirasol has performed an independent analysis of the information and reports provided by First Quantum. Stephen Nano has reviewed the data and prepared this news release, and is a qualified person as defined by National Instrument 43-101.